A Special Town Meeting was held to discuss and vote on the 4 articles briefly described briefly below. 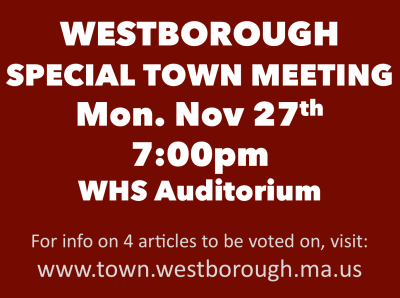 Watch the Special Town Meeting of Monday night, November 27, 2017 here. Westborough TV carried it LIVE on Charter 192 and Verizon 28 and online at westboroughtv.org.